Every year I have a favorite artist; my favorite artist right now is Francis Bacon so I’m trying to photograph characters who might have been in his work. I recently asked Reggie about her process. “I work in a studio just two or three blocks away from the Aloft. It is a crazy mess because I work on many pieces at once. Luckily, it opens onto a garden where I normally work because the light is better. I carry a camera most of the time and take most of my images from my photos. I like birds a lot; I’m working on a number of new pieces with birds in them. I draw inspiration from everywhere, from everything I look at but also from music and literature. ​“My paintings are a combination of watercolor and handmade rice papers which are known as “Washi”, as well as personalized, richly textured papers that I make myself. This combination allows me to express all aspects of my subjects. 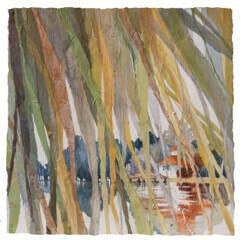 Lynn’s watercolor collages often deal with the vastness of nature compared to human scale. Large, exaggerated skies, tall majestic mountains, vast expanses of peaceful fields all echo this feeling. Her combination of values, color and multiple layers of washi create an exciting composition full of energy and depth. Soft tones next to brilliant blues, purples, greens and golds, invite the viewer to walk through the landscape, to stand and be overwhelmed by the brilliance of the sky or even to experience the intimacy found in her collages of animals. “In the beginning I painted with watercolor only and was never really satisfied with the result. About 20 years ago I took a watercolor collage class from Gerald Brommer and I’ve been hooked on the combination ever since. About half of my paintings are from photographs that I have taken and I take hundreds! The other half is just out of my head. For those pieces I usually just put many types of textured papers down and discover something as I lay one over the other. The papers take the painting forward and I don’t generally paint much into the finished image. I use 300 lb. Fabriano watercolor paper as my base. Rice papers, handmade textured papers I make myself, archival tissue paper, white and black gesso, watercolor (of course) including iridescent gold and silver, acrylic matt medium for adhering the papers to my watercolor paper, gloss medium and tar gel for making textures. I generally have 3 or 4 pieces going at once. They are all at different stages of development so when I need a break from one I can go to another. I keep notes about each piece, where it is in the process, the colors I use and problems I want to solve. That way when I return to apiece, I know what I intended to do with it. Lynn earned her Bachelor’s Degree from the University of Southern California and continued with graduate work at Art Center College of Design in Pasadena, CA. For over 20 years she owned the Alyson Design Group, a graphic design company specializing in magazine and marketing design. 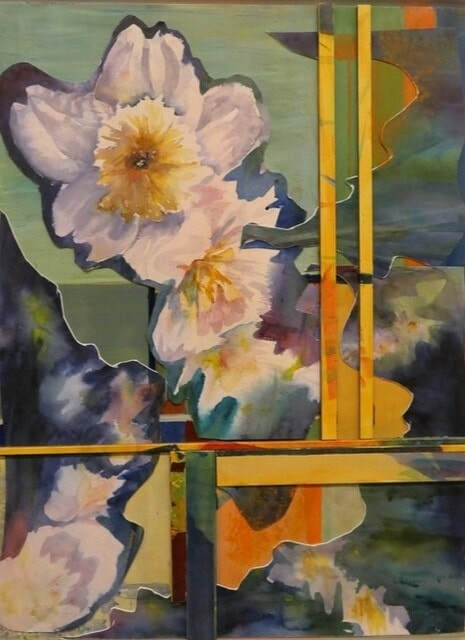 Since beginning her painting career Lynn’s watercolor collages have won numerous awards in both regional and national juried exhibitions. She has been published in Watercolor Artist Magazine, the North Light Publication, Splash 12, Celebrating Artistic Vision and Eyes On Landscapes by Blaze Hill Press. Besides here at the Aloft Art Gallery, Lynn's work can be seen at Gallery 10, Sutter Creek, CA. Quarterly, Lynn continues to give workshops at her studio in Pioneer, CA. She also does demonstrations and workshops for other art associations. ​After a semester of photography in college, I became smitten with the absolute magic of that latent image emerging on the paper in its chemical bath. Amazing! I’ve been dabbling in photography ever since. With the encouragement of friends and the skills acquired through Columbia Community College classes in the ’80s, I’ve participated in a variety of local and regional shows. I’ve been slow to transition to the digital darkroom (I sure miss that magic! ), and I am learning to print all over again. Since my retirement from education, I’ve begun to dabble in watercolor. I love its qualities of fluid looseness and relaxed freshness; yet I tend to paint with precise detail…must be a genetic trait inherited from my machinist father. I love to travel, especially in the southwest, and many of my images are from my road trips. My work has received several Best of Show recognitions, various awards from the InFocus show over the years, appeared on the cover and in the calendar of New Mexico Magazine publications, and has been accepted (with some ribbons) in various shows and other publications. I’m having great fun playing with pigments, pixels, and prints. Featured as "Artists in the Window"
​We are honored to have the exquisite work of Jack Cassinetto in the Window at the Aloft Art Gallery for the month of October and November 2018. ​Jack Cassinetto was born in Sonora, Ca 9n 1944 to Ben and Mary (Sardella) Cassinetto, who were also born in Sonora. Jack's paternal grandfather and grandmother were both born in northern Italy and migrated to California. Benedetto Cassinetto arrived on a ship called Werra, most likely as one of the 1,000 third class passengers, in New York on July 22, 1895 and at some point found his way to Northern California. He settled down in Sonora, married and raised his family. Upon visiting Jack's family in Genoa for the first time in October 2007 the link to the Cassinetto family and Jack's innate ability to create art was established. Jack began creating artwork early on in life and he never stopped creating in one way or another. Throughout his life he worked with clay, stone, wood, and oil and acrylic paints. His Master's Thesis project was in clay and he created five beautiful large pieces of intricate clay that depict scenes from mythology. Later on in life, he found that creating peaceful landscapes, mostly of Northern California scenes, was what interested him the most. His mentors in creating this type of art were Xavier Martinez, Gottardo Piazzoni, and Arthur Mathews, and he spent many hours at the Oakland Museum studying their work. In particular, he loved the many beautiful pieces of furniture and the bold art frames that Mathews created. For the past 20 or so years Jack focused on creating one-of-a-kind frames and beautifully painted small pieces of furniture such as desks and boxes. All of these pieces and his paintings reflect a style of work that is reminiscent of the Plein Air period of the 1920s called the Arts and Crafts Movement that incorporated a style called Craftsman or Mission Style. Many of his hand­crafted frames reflect craftsman and mission style artwork, either as stencils or as added pieces. Jack was a prolific painter, painting on board with acrylic paints (oil paints prior to 2008) and produced much work in his lifetime. He worked daily in his studio from breakfast until sometimes after dinner. He loved art and loved creating beautiful pieces of artwork and has left behind a great legacy of artwork that will be admired and sought after for years to come. Jack died peacefully at his home in January 2018. 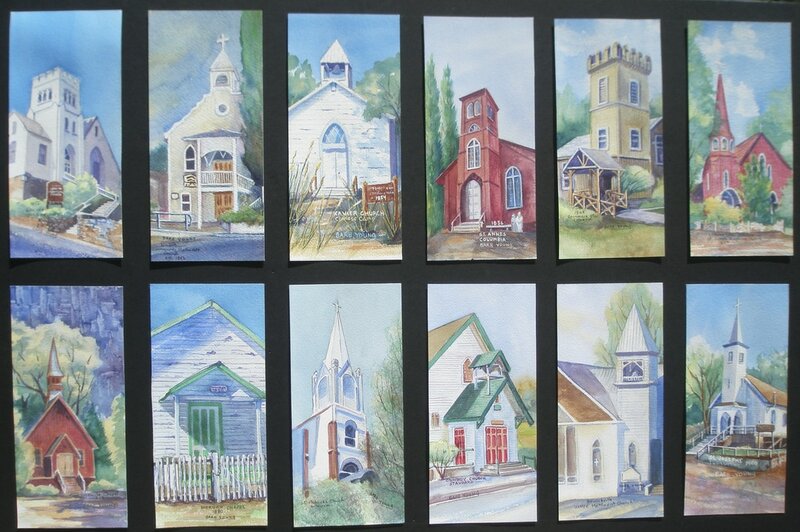 ​Mary Jean St. Claire has been an aspiring artist since the age of crayons. After a heavy focus on art in high school and college, she continued her studies in the SF Bay area with artists such as Howard Brodie and Dr. Raymond Brose. Mary Jean took a long hiatus from painting to study interior design after which she opened an antique store and worked as an interior designer. A move to Angels Camp in 2006 created the opportunity to revisit her love of oil painting. She loves to paint locally and feels fortunate to live in an area with such an abundance of subjects from which to choose. Mary is a member of the Arts of Bear Valley, Mother Lode Art Association, Calaveras Arts Council and the California Art Club. Her work can be found in many private collections throughout the world. 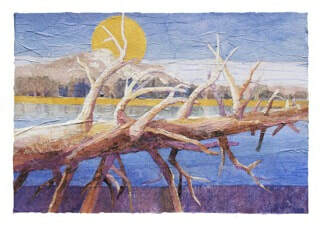 Her original works as well as giclee prints are available to purchase at the Aloft Art Gallery, Town Hall Arts and can be seen online at maryjeanstclaire.com. ​Working in fabric , papers and paint, often all in the same piece, Nancy enriches her images whether abstract or representational with color, texture, and frequently linear designs. Her versatility abounds in depictions of animals, trees, and buildings. 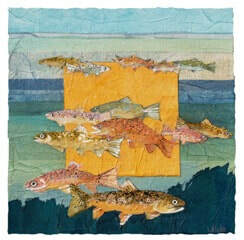 She works in water based mediums or a mixture of fabrics for her fiber art, to create each piece. Her studio located in the Stanislaus National Forest at 5000’ provides a view of nature through the seasons to inspire art pieces as does her picture images from travel throughout the world. Studies with artists, Steve Quiller, John Salminen, Dale Laitnen, Robert Burridge and others keep her constantly in touch with new artistic possibilities. Town Hall Arts in Copperopolis and Aloft Gallery in Sonora display Nancy’s pieces. She also shows with Arts of Bear Valley’s two shows during the summer Music Festival at Bear and during the AOBV show at Big Trees State Park. Her annual juried acceptance into the KVIE art auction every fall allows her work to be displayed state wide. Lorna Hunt joined the gallery in 2009 after being encouraged by a friend. Lorna is a painter using oil and pastel and says she love the “goopyness” of oils. Inspired by the great outdoors is clear in her work, be it the mountains or the seaside.Lorna has a trusty French easel that she can set up in minutes and you may not be surprised to see her painting plein air on the side of one of our beautifully scenic roads.Lorna is a self-taught artist but that said she does enjoy attending classes and workshops whenever time allows. In fact she is now making exquisite beaded jewelry after attending a workshop in Sacramento. Lorna’s director hat is as the display coordinator. Making sure the gallery looks great every time a new or old customer steps foot inside the door. 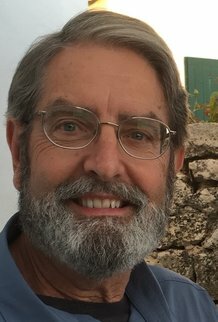 Laurie Lehmann, joining in 2017, is the newest member to the Board of Directors. Laurie is a photographer. Laurie is currently having fun creating photos using some new tools that “manipulate pixels” creating a painterly effect to her works. Flowers, scenery and architecture work best and spring is a great time to capture the images she uses as a starting point. “I am glad that I am finding new creative outlets to enjoy my photography and having them in the gallery takes my work up a notch!” Laurie’s director job is publicity, making sure people in our community know this is a great place to come meet the Artists, find a gift for a friend or something unique for their home. Patty Cherry once said, "Originally the gallery was opened one story above the Vault, an iconic Sonora Building. Hence the name was true to Websters definition of the word Aloft, "high above the ground." But the name is more then that; it is meant to denote the ability to uplift the artists ability to show their work and to elevate the cultural community of Sonora." In honor of the accomplishment of being in business for a decade in downtown the Board of Directors will be featured as “Artists in the Window!” The Directors are six hardworking artists volunteering their time to run this cooperative art gallery! All during the month they put on their “administrative hats”, bringing another skill set, to be sure that the doors are open to this ever changing creative space on Washington Street in downtown Sonora. Renetta Hayes is a founding member and has been with the Aloft gallery since it opened its doors 10 years ago upstairs in the Bradford Building. She paints in oil for it’s freedom of movement and expression and pastel for the detail and vibrant colors available. Her inspiration, “A tender scene inspires me and makes me want to capture the moment.” Renetta paints, with a north light beaming into her studio, on average 12 hours a week, unless distracted by a good game of Scrabble. 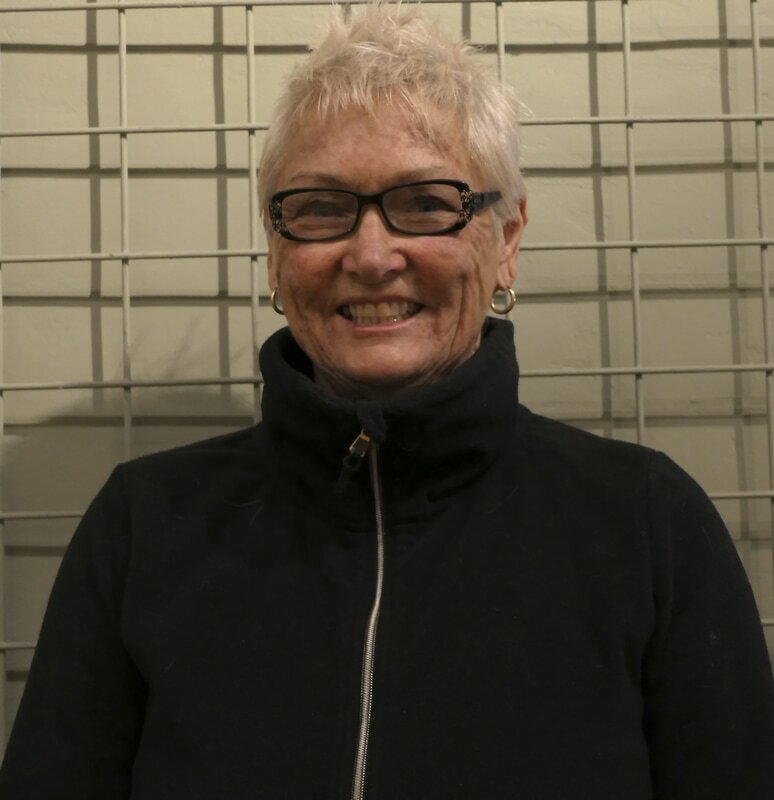 Renetta is the galleries fearless bookkeeper, keeping meticulous records of every gallery sale. Jeannie Philbin is one of the newer members joining in 2013. 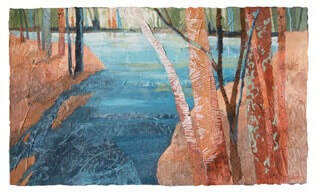 Jeannie’s art is a mixture of oil, acrylic, paper and at least one postage stamp. 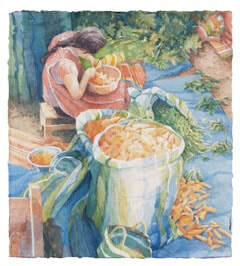 Oil is her favorite as it reminds her of her mother who also was a painter. Jeannie works at least 3 hours everyday in her studio with lots of windows where she can observe mother nature at work. Jeannie’s hat as a director is the membership coordinator. Making sure there is someone at the gallery each day to greet our visitors. Alexis Halsted also joined the gallery in 2013. Alexis is a ceramic artist. Her influences are clear; Pueblo, Roseville and Mission style pottery. Alexis has a designated building in which to create and she spends on average 15 hours a week. Alexis loves clay because “there is no end to what you can create!” Alexis hat at the gallery is budget and finance. Thank goodness for us all that she can engage both sides of her brain and get this job done! Alexis is glad that May 1 marks the celebration of our tenth year of operation! Kate Frederick has produced and shown art for the last 25 years. Her home and studio are in Hathaway Pines, and filled with all kinds of bright and bold work.Kate, as a precocious kid, dabbled in just about every form of creative media from mud to more refined forms of art materials. “I cannot remember a time when I wasn’t making something to hang on a wall”. She is inspired by the colors and forms of nature and always exploring something new. We have two gallerywindows to maintain, Baer’s window down the street and our front window we call the “Artist in the Window” and it is Kate’s job as director to oversee their transformations each month. Curtis Mothershed has quite a resume. He has transplanted to Sonora from the Santa Cruz area. 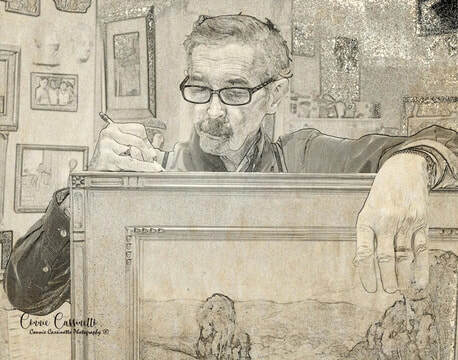 This is where he honed his skills as a technical illustrator and fine artist for over 30 years. Some of his projects were; developing artwork for Service & Parts manuals for Indian Motorcycle Company or 102 illustrations in 10 months for 3 medical training books at UC Stanford. Other top-tier clients, included Berkeley National Lab, Gallo Winery, US Postal Service, Xerox, Paramount Studios, US Winter Olympics and more. 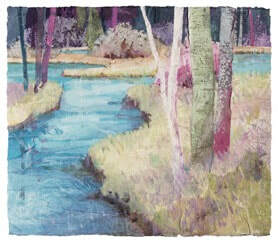 To create landscapes and seascapes he uses his favorite technique; drybrush watercolor. He enjoys this technique because the effect created is unique and can’t be achieved by other art methods. “It is more time consuming than traditional transparent watercolors and takes patience to learn the technique. Using very little water on the brush, I apply the paint using crosshatching and scrubbing. I start out with transparent washes and build up an under-painting with some colors to set the mood and temperature of the scene.” Curtis works on location whenever possible, working quickly to get the lighting and mood of the location. Curtis’s work will be in the window of the Gallery for the month of April. Laurie Lehmann has been a photographer as long as she can remember. It all started with a little point and shoot and rolls and rolls of film. Children were born and adopted and she photographed. She and her husband Bob built homes, went to festivals, played music and she photographed. First days of school, family vacations and birthday parties. Documenting life and what was created was a whole closet full of photo albums! Now she calls herself a documentary photographer. “In the moment” best describes her style. Not one to stand there waiting for the sun to be in the perfect location. If it happens, it a gift! If not, she moves on. Laurie has been blessed with an adventurous family. One that supports her need to step out of the ordinary and wiggle through the crowd to be able to see everything up really close, always with her camera in hand. Laurie has taught herself a lot over the years technically and artistically and has had the opportunity to practice all over the world. Traveling, documenting, processing, sharing. Then, in 2012, Laurie was diagnosed with malignant breast cancer. For anyone that has heard this news you know the world stops spinning. For 8 months cancer made “going out” challenging so Laurie began to experiment with collage art. The 6 pieces she created show the chronological journey of emotions she felt during this time. These emotions were very much like the stages of grief. They were: profoundly emotional, afraid, out of control, sadness, hope and then relief. 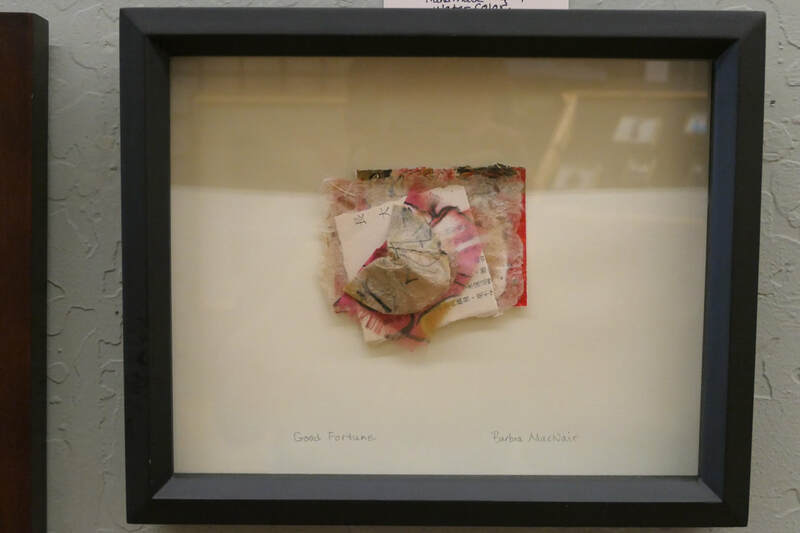 When asked to be the featured “Artist in the Window” Laurie saw a perfect opportunity to share these collage pieces and recall that time, 5 years ago this month, in her life. The 6 emotion collages are paired with 6 photographs that she hopes capture these same emotions. This opportunity has proven to be a great way to honor that journey. Laurie is back to traveling the world, attempting to take that photograph that no one else has taken. It’s been over 50 years of photographing and still going strong! 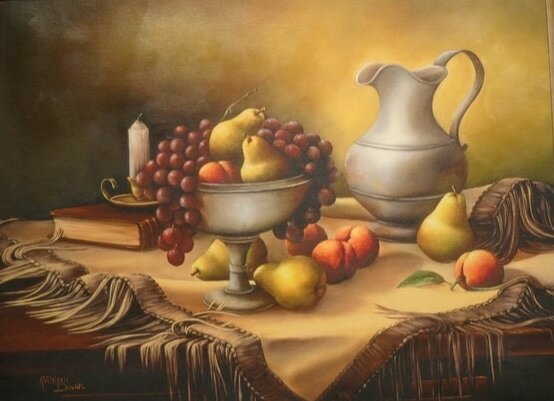 Joann started painting in oil s as a member of “Art in the Park” in Oakdale, CA in the 1960’s, and continued painting until taking time off to concentrate on building a business. After retiring she discovered her love for watercolors. Joann has won numerous awards over the years and many of her paintings hang in private collections. 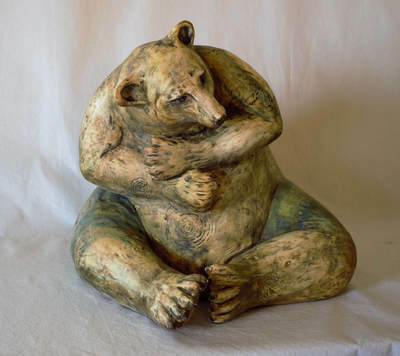 Primarily self-taught, she has participated in workshops with Tony Couch, Dale Laitinen, Al Sabin, Jill Figler and Kathleen Davids, as well as workshops in Texas, Idaho and Nevada. She is a member of the Mother Lode Art Association and Oak Valley Art Society, and a former member of associations in Idaho, Texas and Nevada. ​Martas work is a sight to see. She brings her creatures to life in clay. Come by and peer into the window then come inside and take a closer look. In her own words… “I like to make things; and if it has fur, feathers, or foliage, all the better. The animal sculptures are the physical expression of my sense of stewardship. I hope my work expresses my reverence of nature. The ceramic surface is a constant interest and challenge. Textured glazes, coloredslips, and sgraffito (scratching into the surface) have interested me for many years. I also enjoy wood firing, which leaves a deposit of ash on the work during several days of stoking the anagama kiln, and raku, where the finished surface is dictated by the combustible material and atmosphere you subject the piece to after removing it from a red hot kiln. I like those “uncontrolled” opportunities. Barbra has been exploring various art forms and media as long as she can remember. 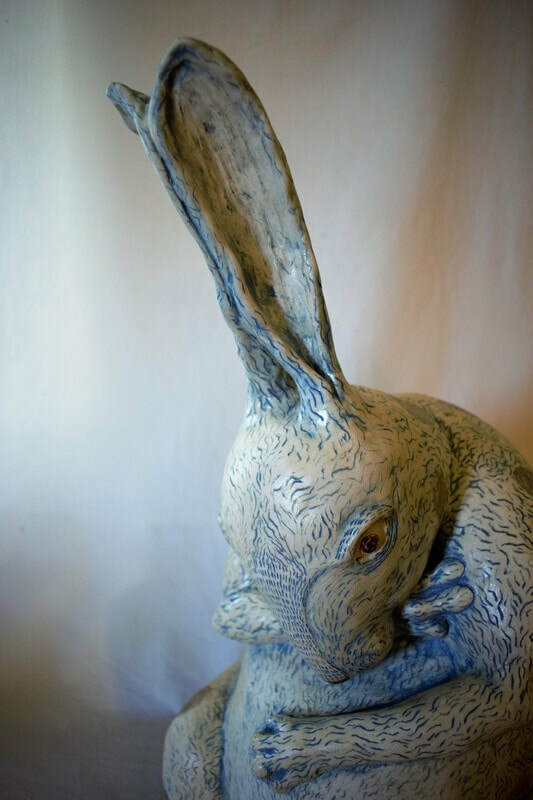 Over the years she has worked with ceramics, fiber art, polymer clay, metal enameling and found objects. She also makes beautiful handmade paper. Her current pieces bring these various media together in new and intriguing ways. She hopes that the multidimensionality of her art engages you in a deep and satisfying experience. 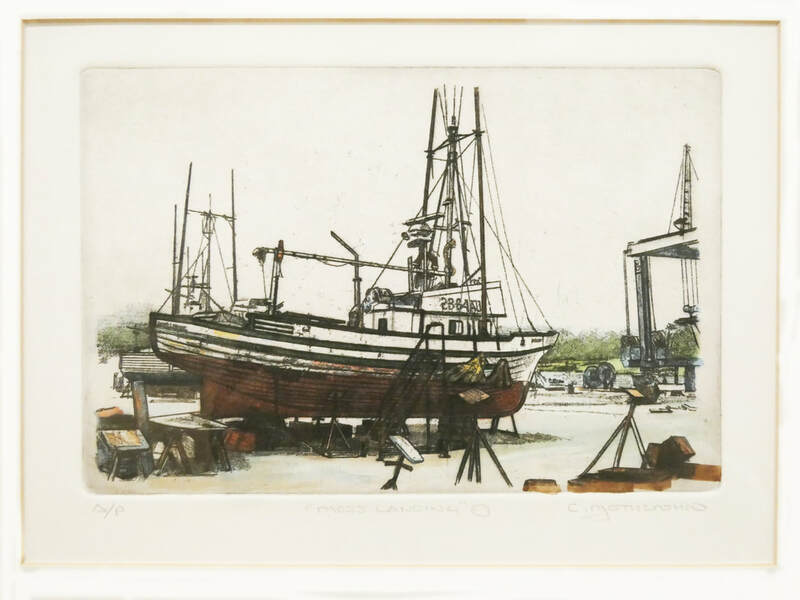 John considers his passion to be printmaking, using a variety of techniques such as etching, aquatint, linoleum and woodblock printing and monotype. He has studied under Belgian Artist, Rene Classens and Bay Area artists Luz Ruiz and Toru Sugita. His work has been shown in over twenty-five shows in California, winning numerous awards. 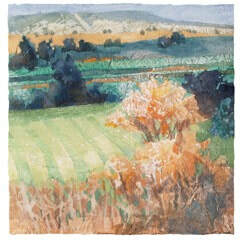 John’s other mediums include pastel (studying with Tina Moore of Stockton), watercolor, acrylic and ceramics. John’s earliest recollections of making art were of using clay, finger paints and crayons. Art period was his favorite time of school and he was encouraged by his early art teachers. 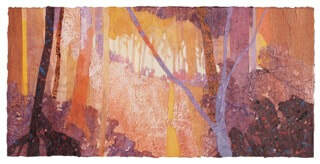 The evolution of his print making began in 1973. “When living and working in Brussels, I took instructions at night from a print maker, Rene Classens. He taught me in heavily French accented English to etch, aquatint and print with his ever-present Gaulois cigarette dangling from his lip. He let me make the poster for the Artists December Open Studio and helped me sell my first print.” Returning to the States in 1974, it would be almost thirty years before John took up etching again. Life has a way of being daily. Diablo Valley College rekindled John’s love of art. In 2002, John took figure drawing after 30 years away from any formal instruction. Drawing from life helped develop his ability to observe critically and begin to use the human figure in his other work. He explored new mediums, such as pastels and watercolors, in figure drawing, landscape and still-life. Acrylic painting classes followed and he began working on larger pieces as well as revisiting ceramics. 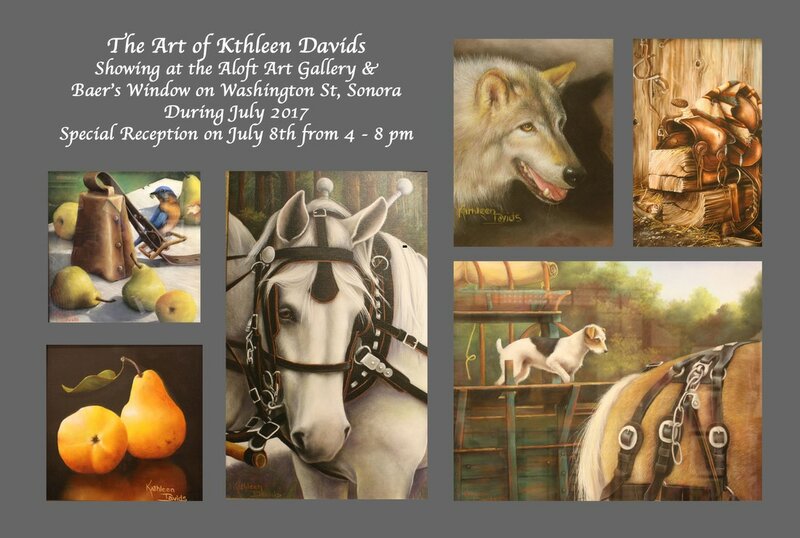 Kathleen (Kitty) Davids is an accomplished award-winning artist currently residing in Sonora, California. Kitty, as she’s known to her friends, has studied pastel, acrylic and watercolor painting most of her adult life. 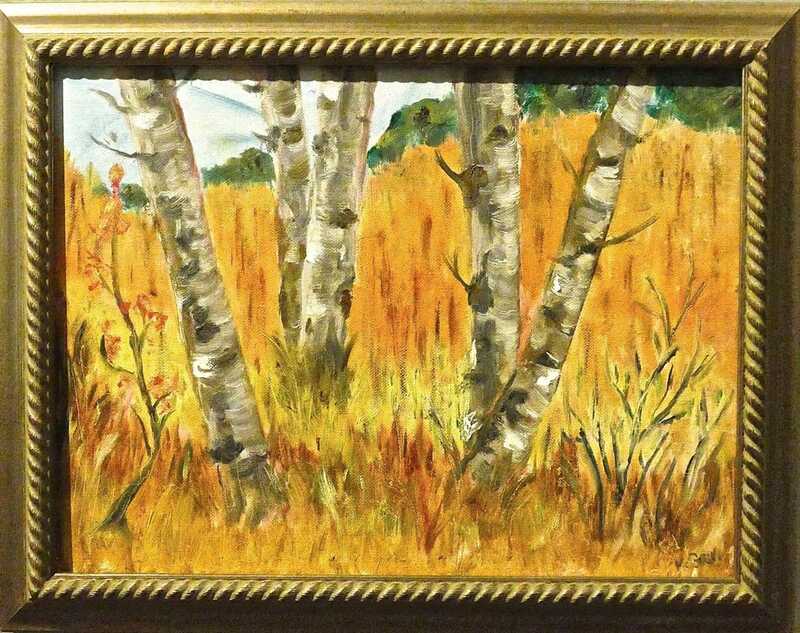 While studying with Patricia and Elizabeth Hubble, she discovered the wonders of oil painting. Kitty has attended and learned from many master painters in workshops in Utah, Montana, Colorado and California. The Aloft Art Gallery has been blessed to have Kitty as one of its 37 co-op artists as well as having her sit on the board that helps keep the gallery going! 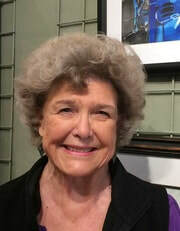 Kitty has been an active member of the Mother Lode Art Association, the Pastel Society of the West Coast and the Central Sierra Arts Council. She has done commissioned art-works that hang in private collections as well as original murals all over Northern California. Kitty has been teaching fine art painting for many years in her Sonora studio. The Aloft Art Gallery is excited to have a special event on 2nd Saturday July 9, featuring Kitty’s work in the gallery and also in the window in the Baer’s Alcove. ​Barbara Young’s early days in art were spent trying to copy cartoons from comic books and doing paint-by-number paintings. For several years her drawings were usually sad and/or gloomy. In her last year of high school she won an Art Scholarship to Sacramento City College. There she took the basic classes in art and was taught many good principals that have grown and enlarged in her work since. Barbara’s parents lacked the resources to help pay for further art studies, which meant she had to work and an art career did not materialize. Barbara worked as an Institutional cook for 16 years and her last job was at Columbia College as a custodian where she retired in 2004 after 16 years. ​Merla has been involved with World Vision for 16 years. At present she is sponsoring 20 children in Ethiopia. The girl in the picture is Meseret who she has been sponsoring for 16 years. She will graduate from college in May. She is so proud of her for accomplishing something that almost seemed impossible. The money she receives from her artwork goes to send money to her sponsored children for things like animals, clothes, and necessary things to help change their lives. Merla's greatest joy in life is being able to help children and their families. 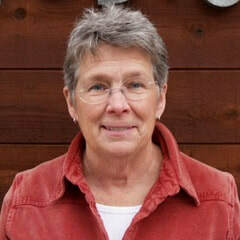 ​Merla is a former landscape designer, and contractor. About 18 years ago she fell in love with working in clay. 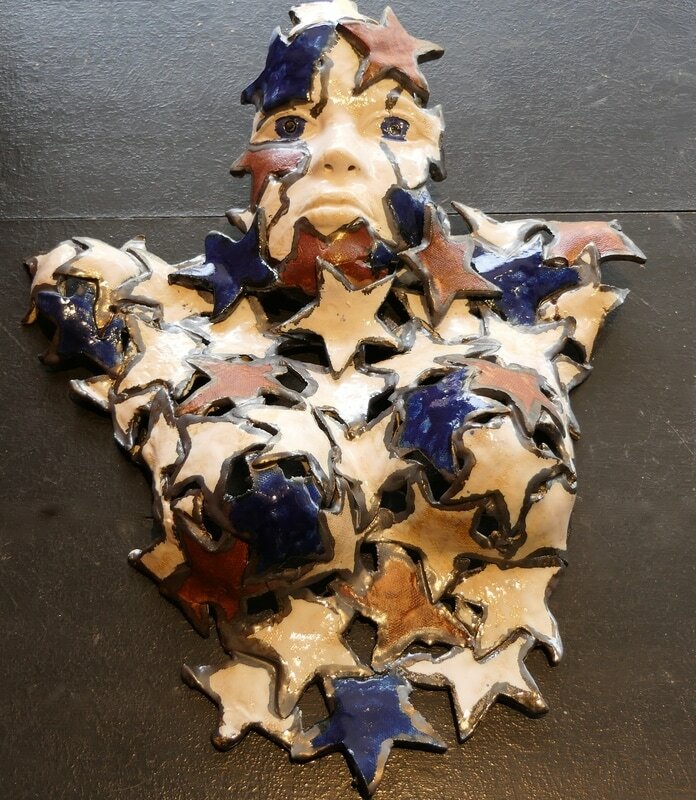 Since then she has created her own glazes and created ways of firing high fire stoneware. Her latest projects have been sculpting horses. She believes them to be spiritual creatures with lots of expressions she finds intriguing. Her biggest accomplishment’s in art was winning the Sonora Fair best in show award 3 years in a row. She went on to get a first and 3rd place award at the state fair. 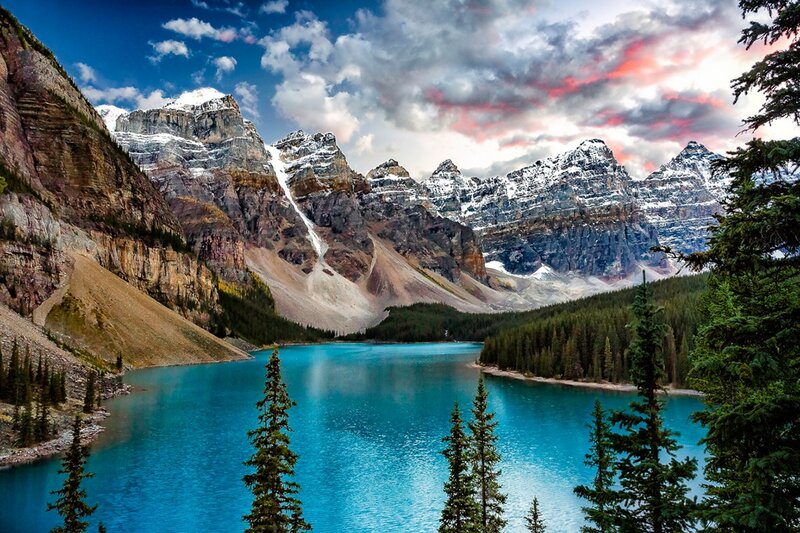 ​This month the Aloft Art Gallery is excited to be featuring Gary Johnson, a certiﬁed professional portrait and landscape photographer, for the month of March. Gary will be revealing two new very unique works as the gallery’s featured artist, a painted family portrait and a back-lit landscape image. 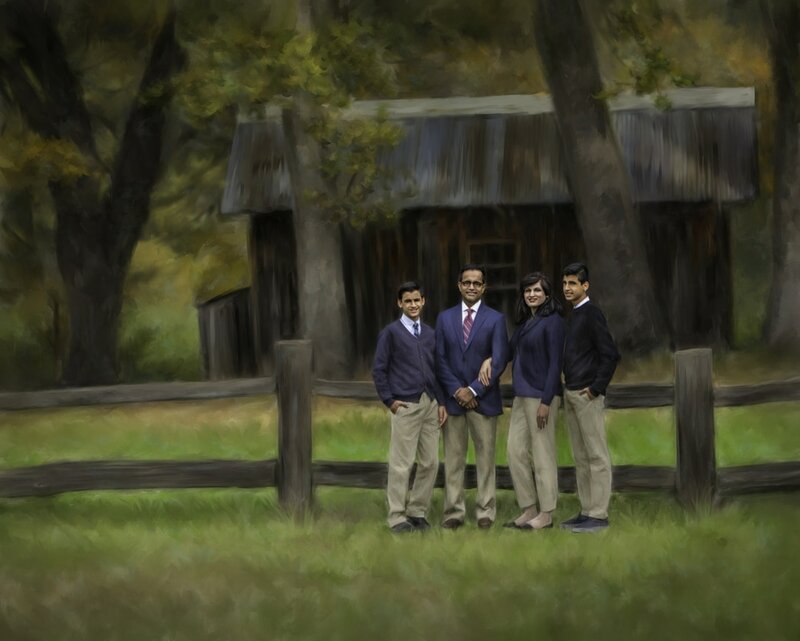 Gary specializes in photographing family portraits at beautiful locations around the county in his portrait studio in Sonora. Along these lines, the first piece he is debuting this month is an artist-rendered hand-painted canvas of a family portrait he photographed earlier this year. What do we value and hold close today? Do the things we hold dear now persist throughout our lifetime, or do they evolve and change? 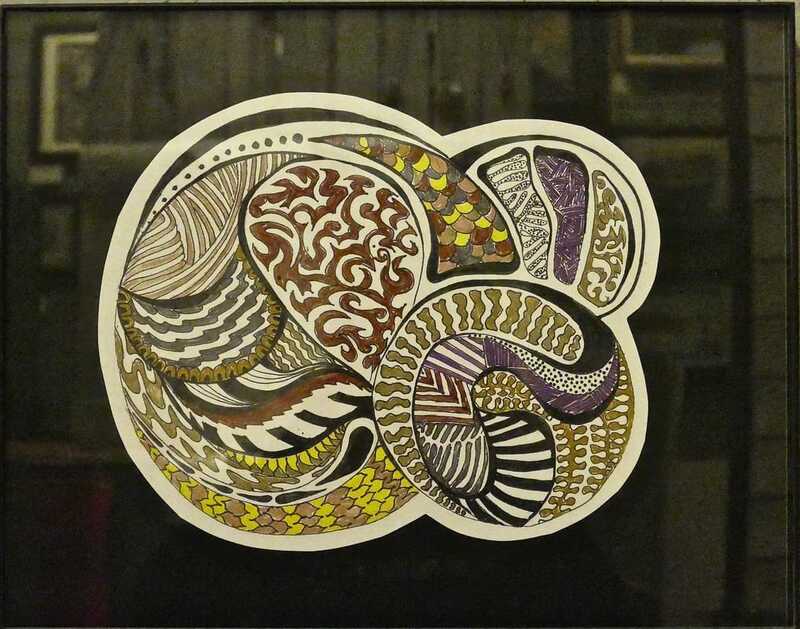 The art that is featured in the window of the Aloft Art Gallery, by Kina, challenges you to think about how your values today, effect the emotions you feel while viewing her art. Step back and think how your perception of these pieces might change given the passage of time. 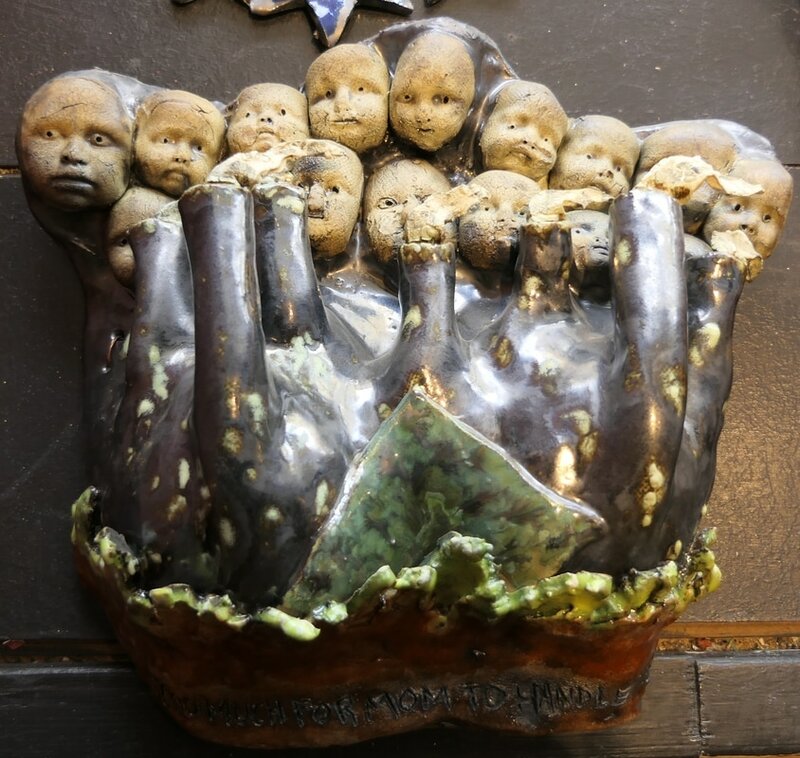 Christine "Kina" Halley has been creating thought provoking works in clay for the past 15 years. 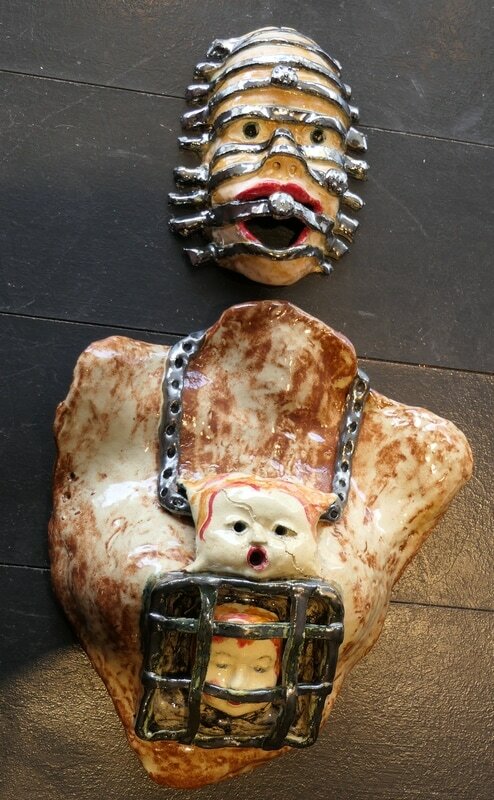 Kina works in mixed media, using clay as her base mask material, then adds metal and found objects to embellish the piece. Each mask is original with no two alike. Kina does not start with a sketch or a picture, rather she lets the masks come out the way the clay wants them to. She has participated in numerous art shows and county fairs. She has exhibited at the Fillmore Art Show in San Francisco and the Lincoln art Show, to mention a few. 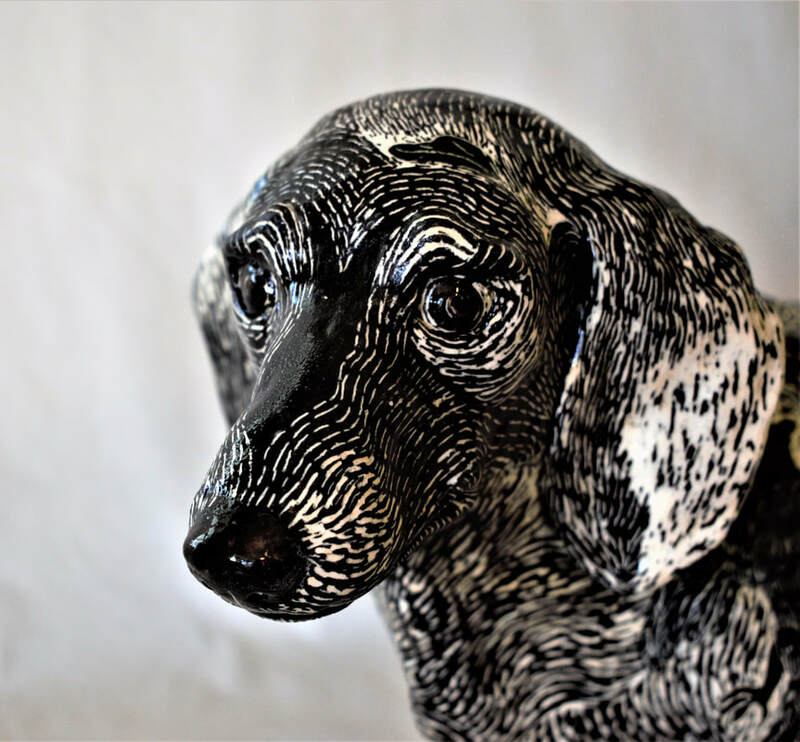 She won “Best of Show” at the Columbia College Art Show, the Calaveras Co. and Mother Lode Co. fairs, and also an award at the California State “Best in Show” Invitational Exhibit. Besides being exhibited at the Aloft Art Gallery her work can be found in a gallery in Hawaii and on walls all over the world. Kina also currently owns the KINART gallery and studio at 145 S. Washington St. in Sonora. The gallery features different artists each 2nd Saturday. Her goal is to encourage up and coming artists, of all ages, to express themselves and feel alive in showing their work. Kina wants to encourage that creative and loving spirit in all of us. 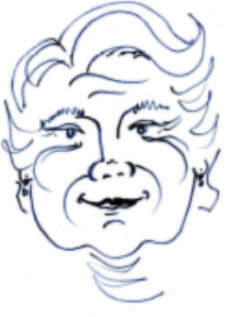 Cary grew up with an artist for a mother, then married an art major and raised two sons who both majored in art, so she has been around, among, and in the midst of art for a very long time. ​After a 30 year teaching career in Humboldt County, Cary and her husband moved to Columbia to be closer to their family. It was then that she decided it was her turn to be a painter. Cary studied with Gereon Rios after moving to Columbia. She has also taken classes from Diana Boyd. She is an active member of the Mother Lode Art Association and is currently showing her work at the Aloft Art Gallery. Through the years her heart was filled with happiness and life treasures... The truth is she never let go her spicy Peruvian spirit. During a period of soul searching, SPICYHEART was born. It reminds her of who she is, where she comes from and the way she wants to project her world. "No matter where you are just be yourself, be your own wild flower" as she says. Each piece of jewelry is very unique and tries to connect with your personal story and your own journey. Nature is a great source of her inspiration the ancient cultures fascinate her. You can perceive a bohemian and vintage style that is captured in her designs. ​Alicia loves to travel and enjoys historic Sonora. Her mother is part of the community and reconnecting with family is a great joy.